Max, a West Highland Terrier, could have lost his life last Wednesday when he came into the hospital in a state of collapse. The doctor on duty instantly recognized the symptoms of ethylene glycol positioning, and treatment began immediately. Things weren’t looking good for Max. Ethylene, commonly called antifreeze, has been the cause of countless deaths of family pets for decades. Ingested antifreeze produces metabolites in the blood that are extremely toxic to the functional units of the kidneys. These toxins lease to a rapid onset of kidney failure with dizziness, upset stomach, and eventually coma and death. Treatment for Max’s antifreeze poisoning consisted of intravenous injections of ethyl alcohol every 4 hours. Ethyl alcohol works by competing with the antifreeze for a chemical called alcohol dehydrogenase, the chemical that breaks down antifreeze into the toxic metabolites. Alcohol dehydrogenase prefers to break down ethyl alcohol instead of antifreeze, so when ethyl alcohol enters the blood stream, the antifreeze is excreted unchanged from the kidneys and no toxins are produced. Antifreeze is also known to cause oxalate crystals in the urine, and when he came in, Max already had these crystals as well as blood in his urine. Peritoneal dialysis began at 2:30pm, in which an IV was placed in his “belly button” that filled his abdomen with fluid to help flush out the toxins. At this point, Max was still unresponsive with the antifreeze level in his blood 60 times higher than the upper tolerable limit. The peritoneal dialysis was repeated every hour until 11:30pm by the doctor and veterinary technician. Blood results that had been rushed to the lab came back and showed Max’s kidneys were fine/ By 7:45 that night, Max was wagging his tail, by 9pm Max’s urine was clear again, and at 9:15pm, Max was standing! The doctor took him home for the night where his condition further improved. It was back to this hospital Thursday morning and the catheters were removed and Max was sent home that evening. He returned for a few day visits for the next couple of days for some IV fluids and blood tests to confirm everything was in working order, which it was. All Max had to do now was take some antibiotics. Max has certainly come along way. It’s been a week and one day since the accident and Max is back at the hospital again, this time for some TLC with the groomer. Yes, he’s getting a haircut. If Max could talk, he would say “Thank You” to the doctor for her knowledge and quick action which undoubtedly saved his life. And he would give a big kiss to his other doctor for his around the clock care and to the veterinary technician and all the other support staff for nursing him back to health. We wish Max all the best and with that in mind, please remember to be extra cautious when handling antifreeze. 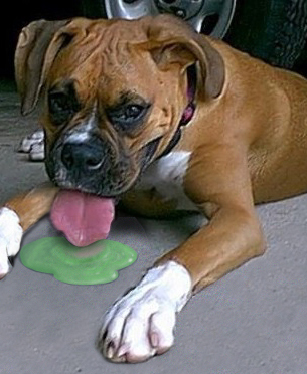 Its sweet tastes makes it appealing for animals to lick, and even just a few licks off the driveway, as happened with Max, could have deadly consequences.